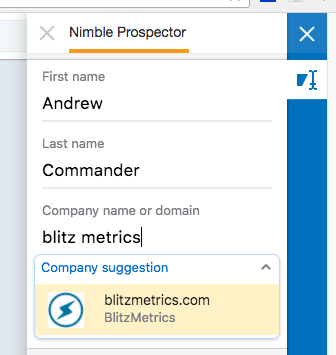 Nimble Prospector is a brand new feature included with Nimble that allows you to discover the lead details of a contact when you are visiting their record in Nimble or working on the web with the Nimble Smart Contacts App. How are emails verified and what is the confidence score? We developed Nimble Prospector to help you prospect smarter with complete contact information. Now, sales, marketing and business development professionals have an easy way to discover contact information for qualified prospects in seconds. With that said, the basic workflow for using the Prospector feature is to find the email address for a contact, send a message to them in Nimble via Group Messages, measure the effectiveness of that message, use Nimble to schedule follow ups, and then turn that connection into a sales opportunity managed via Deals. How do I activate Prospector and where do I use it? Since Prospector is a feature of Nimble, all accounts already have it. Access the Prospector feature via the Nimble Smart Contacts App or while viewing a contact record in Nimble. For full Prospector billing details, visit this article. Nimble Business Plan accounts include 25 Prospector credits per user per month. Nimble Legacy Plan accounts include 10 Prospector credits per user per month, but may purchase an Add-on plan for the prices listed below. 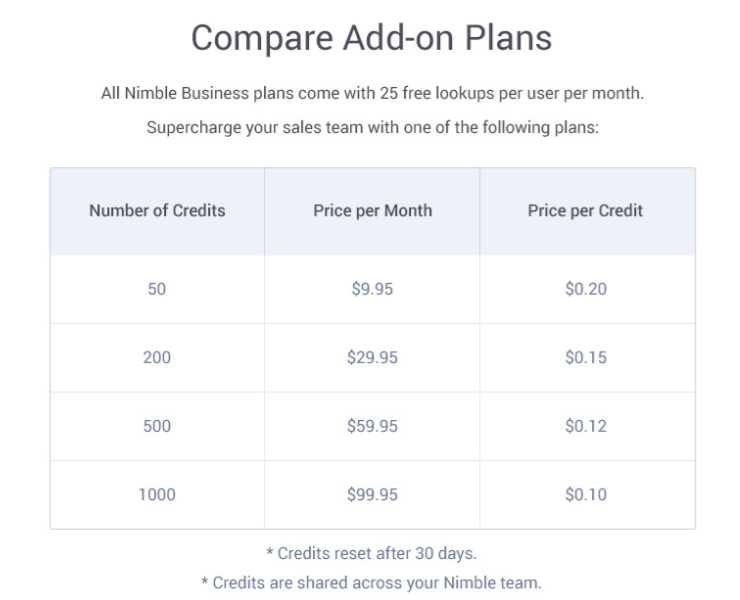 Nimble Trial accounts have 10 Prospector credits per user per trial. Add-on Plans are shared credits across all team members. How are Prospector credits used? Prospector credits are used when an email is found and verified. Valid format: We verify that the format of the email address is correct and looks like "email@example.com". Check for random formatting: We check that the address doesn't look like a random junk email like "12y2io3o@company.com". Disposable Email Address: We check to make sure the email doesn't exist at a temporary disposable email domain such as mailinator.com. Webmail Email Address: We verify if the email address is from a commercial webmail provider like Gmail, Yahoo, or Outlook.com. MX Record Verification: We check if there are MX records on the company domain, otherwise, the email address can't receive messages. Presence of SMTP Server: MX records indicate whether or not the SMTP server can be reached. SMTP Verification: We test the email address to make sure it doesn't bounce. Accept-all Domain: We test if the server accepts all email addresses via a catch-all policy. The Confidence Score on a discovered email is an estimation of the probability that the email address returned is correct, between 0 and 100. Anything over 75% is likely to be delivered. Prospecting emails that are "Not Verified" will not cost any credits to your account to add to Nimble. Prospecting emails that show "% Confidence Level" use a credit when the search is performed, as these emails have been verified to work at some point in time. When you hover over a contact name anywhere on social media or the Web, Nimble will surface broad social profiles as well as any contact history, if they’re already in your database. For new prospects, enter their first name, last name, and company domain URL (Nimble will suggest alternatives, or you can enter one), and Nimble will return search for their email, phone number, social profile, locations, additional URLs, and etc. Twitter is a powerful network for information and making initial connections, but every conversation eventually makes it to email. Here's an example of how to discover the email address for a Twitter contact. Go to Twitter and select your notifications to check out recent followers and mentions. 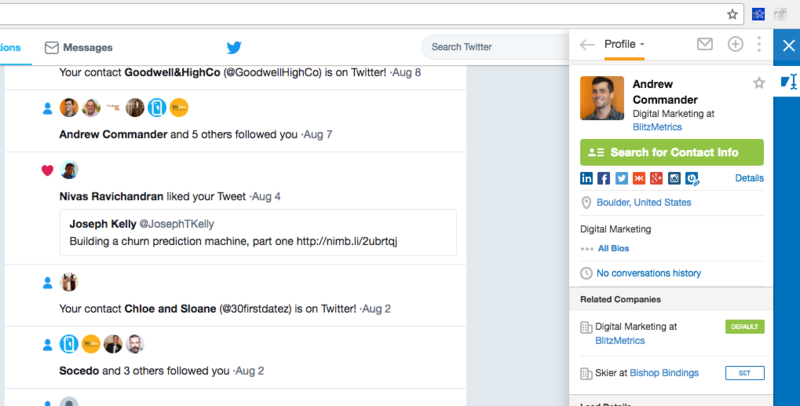 Open the Nimble extension and hover your cursor over any Twitter profile. Select "Search for Contact Info" to launch Nimble Prospector. In Nimble Prospector, plug in the contact's name and company domain. Type in the company name to pull up a suggestion from Nimble. Nimble Prospector will locate multiple data points including email, phone number, website url, location. Prospector will show contact details and then select “Save Data” to store on Nimble. You can also use Prospector to add data to incomplete records in your Nimble CRM. Go to a Nimble record, for example a Twitter profile you previously uploaded that is missing an email. Select "Search Contact Info" to discover their email. This will pull up a pop up with all of the data fields we have found. This example would consume one Prospector credit. By combining Nimble Prospector with our Group Message workflow, we have developed an end-to-end prospecting solution that enables you to qualify prospects, discover contact information, send outreach, measure success, and manage relationships at scale. After you’ve gathered prospects’ contact details, use Nimble’s Group Message feature to send targeted email messages to 100, 200, or 300 contacts per day (depending on your plan). Group Messaging offer a fast, effective way to send personalized messages to any targeted segment, which you can define using Nimble tags. Be sure to track outcomes and schedule follow-ups to help you close more business. When on LinkedIn, you may type in the name of a contact into the Nimble Smart Contacts App to bring up their contact record or create a live profile in Nimble. From there, you can enter their company domain to perform a lookup of their company email. If you're looking to reach out to a company and want to build a list of contacts for outreach, the "About Us" or "Team" section on a website is usually the best place to start. Select a company and go to the “About Us” or “Team” page. Hover over team member and type in their company domain. Nimble will search for additional data points, which you can save in Nimble by clicking Save Data. Crunchbase is a great resource for profiling many companies and their team members. 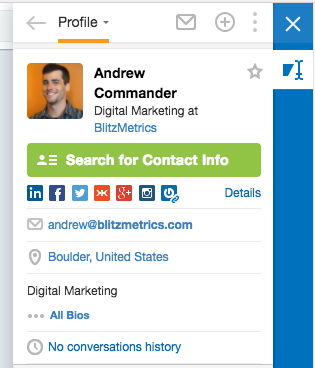 By using the Smart Contacts App + Prospector on Crunchbase, you'll discover contact details with ease. One of the best applications of Nimble Prospector is the ability to discover contact details for your Facebook interactions, giving you a direct line of communication. Go to Facebook profile or business page notification. Select a contact to profile. Indicate which company they work for, and run Prospector. Since the Nimble Smart Contacts App can be used anywhere on the web, there are infinite uses for this new feature. Give it a spin and let us know what you think!